If you've been paying attention to comic book movie news, then you've already heard that Jeff Goldblum has been cast to play The Grandmaster in Thor: Ragnarok, which is currently in production. But who is The Grandmaster? The first thing that I think of when I hear the word grandmaster is a person that has mastered the game of chess and has become one of the elite players in the world, and that isn't too far off from who The Grandmaster is in comics. In fact, one of the first things he says is a reference to chess when we first meet him. In this issue of the Avengers, the team gathers around a seriously injured and dying Tony Stark. As they are trying to find ways to help save his life, Janet Pym finds an odd glowing "doll" underneath one of the cabinets in the room. Thinking nothing of it, she tossed it in the garbage. As this "doll" hits the trash can, it starts growing in size. Eventually it grows to an enormous size and kidnaps Tony Stark. It then uses Stark to lure the rest of the Avengers to Kang the Conqueror's lair in the year 4,000 A.D..
Kang informs the Avengers that he summoned them there to help him defeat the Grandmaster. The Grandmaster came to Kang a year before and challenged him to "a game not unlike that which men once called chess". At stake is the planet which Kang rules over. When The Grandmaster returns to play his sinister game, three of the Avengers (Thor, Captain America, and Goliath) are transported to the gaming arena. Shortly after their arrival, they meet the Squadron Sinister. Now that the synopsis is done, let's talk a little about some of the characters that make their first, or second, appearance in this comic. Let's start off with the strange glowing "doll". This doll isn't a doll at all. 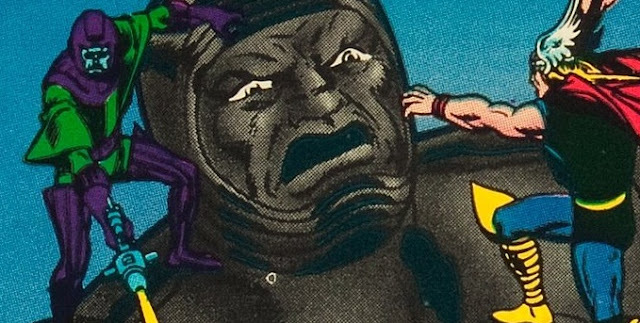 It is in fact The Growing Man, and he makes his second appearance in Avengers #69. His name is a little deceiving as well because he isn't a man either, he's actually an android. The Growing Man is a Stimuloid that was created by Kang the Conqueror. Every time a Stimuloid is attacked or hurt, even if he does it to himself, he grows in size, and there is no limit to how big he can grow, hence the name, The Growing Man. Next we'll tackle the first appearance of The Grandmaster. His real name is En Dwi Gast. He is one if the Elders of the Universe, and he has mastered most civilizations' games of skill and chance. He enjoys playing games that put teams up against each other. The team that The Grandmaster uses to go up against the Avengers is the Squadron Sinister. The members consist of Doctor Spectrum, Hyperion, Nighthawk, and Wizzer. It's said that the Squadron Sinister is based off of DC's Justice League of America. Doctor Spectrum's real name is Kenji Obatu, and was based after the Green Lantern. He gets his powers from the Power Prism, which also makes it's first appearance in this issue. Instead of being vulnerable to the color yellow, it's ultra violet light that he has a weakness against. The character of Hyperion was loosely based off of Superman from the JLA. He was created by The Grandmaster and made to believe that he got his powers from his planet exploding. Hyperion's real name is Zhib-Ran. The next member of the Squadron is Nighthawk, and his JLA counterpart is The Dark Knight himself, Batman. Nighthawk is also known as Kyle Richmond. He was the son of a wealthy businessman that was never around. After the death of his mother, he was raised by a governess. After his father died in a plane crash, he inherited the family fortune. The last member of the Squadron Sinister is The Whizzer. I'm pretty sure that we can all figure out who his Justice League counterpart is. It's none other than the Scarlet Speedster, a.k.a. The Flash. James Sanders was a disgruntled chemist. He was approached by The Grandmaster to join the Squadron Sinister, and in exchange he was given the power of super human speed. Sanders is currently known as Speed Demon. It's easy to see the parallels between the Squadron Sinister and the Justice League of America. Many of the backstories and their powers are very similar. There aren't a lot of copies listed in the CGC census, but that doesn't necessarily mean that this comic is rare. It's far more likely that not many people knew about the key issue goodness in this comic before the announcement that The Grandmaster was going to be coming to be big screen. However, it could also have a lower print run. I don't have the numbers for that, but while searching through eBay and other online comic shops, I couldn't find more than a handful of copies for sale, slabbed or raw. There are a couple of possibilities for this. Maybe people are still holding on to their copies for some reason, or perhaps their copies are currently being graded by CGC, CBCS, or some other grading company. Ok, let's take a look at the CGC census numbers. Currently there are only 155 copies listed on there, and only one is a Restored copy. Most of the copies are high grade between 9.0 VF/NM to the highest 9.8 NM/M. Six copies are graded at a 9.8 NM/M. There are a handful of mid grade and also a few lower grade copies listed as well. Most are graded a very respectable 9.4 NM with 38 copies. It's not surprising that there haven't been a lot of sales for already graded copies, since there are so few already graded. Back in 2012, you could snag yourself a nice high grade CGC 9.6 NM+ for a little more than $200. A copy sold at Heritage Auctions for $215.10 in Jan. of that year, and copies on eBay were dropping for around $250. Jump forward to today and it's a whole different story. The latest sale for a CBCS 9.6 NM+ sold for $450 in Sept. of last year. Sales for 9.4 NM copies have climbed up even higher. The last sale for a CGC 9.4 NM went for auction on July and sold for $425. One sale even dropped at a penny shy of $1,000. 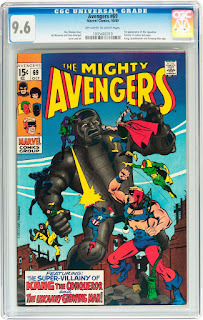 If you have a copy in your collection, you may want to think about putting it out in the market, Or, if you can find a decent raw copy, you might want to snag it and send it in to be graded. Don't wait to long if you're looking to but, I'm pretty sure prices for raw copies will be going into the stratosphere very soon.